Stop the alien bunnies at all costs! 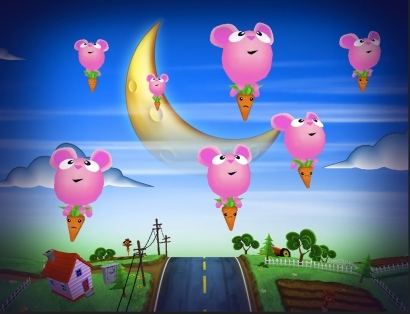 The carrots are just relaxing and enjoying another day on the farm with their friends until the inflatable bunnies from space start kidnapping them to feed their robo-bunny overlord. Tap your way through twenty levels, fighting off four kinds of evil bunnies while collecting gems for points and items to help you along the way. The game opens to a strangely long, by iOS game standards, opening sequence. Thankfully it doesn't happen every time you load up the game but if you do want to watch it, or someone new is starting the game up clicking on the movie clapper in the upper left hand corner of the menu screen will let you see it all over again. It starts off very basic; one kind of bunny coming at you at a slow pace and a few at a time. Getting used to the basic tap-to-pop controls is extremely and will allow everyone from children to adults the ability to pick up and start playing the game right away. Each level works exactly the same way, the screen follows along a path across the farm and bunnies will come down the road at you and try and take the carrots. If they manage to get to the bottom of the screen you'll lose a carrot. When you run out of carrots you essentially die and have to restart the level. There are four kinds of bunnies that will be coming at you. Initially it will just be pink ones that come straight at you and yellow ones that will zig-zag there way down the path towards you. A few levels in you'll have what can only be described as a franken-bunny join the the ranks. He's quite a bit larger then the others so you'll have to tap him twice to kill him, but watch out because he will eat everything in his path; animals, gems and items won't slow him down at all. Finally we have the grand overload himself, robo-bunny. He comes flying in with his space ship and is quite a bit faster then the rest of the gang but just as easy to beat, one quick tap will destroy him, but like franken-bunny he will destory anything that passes beneath him. One major thing to remember is that if the robo-bunny gets through it's game over, no matter how many carrots you have stocked up he will take them all. Ubisoft surprised everyone late last year when they revealed that the oft-delayed action/adventure I Am Alive is not only still in development, but is nearing release. Fast forward to today, and a quite a bit more information has surfaced about this elusive title. Firstly, it is set to be one of the featured titles in the recently announced XBLA House Party promotion. Don't be discouraged by IAA's new XBLA format; it is a full retail title that Ubisoft just so happened to distribute via digital download. Whereas so-called "traditional" Xbox Live Arcade games tend to be shorter titles, that lack the depth and visual fidelity of their physical counterparts, this is simply not the case with this game. Taking place after a year after an apocalyptic occurrence referred to simply as The Event , I am Alive follows the story of a mountain climber's desperate attempt to reunite with his family, amid the ruins. In the process, our hero will encounter a wide variety of characters, some helpful, some needy, some malicious; but never undead. In a refreshing twist, developer Ubisoft Shanghai is avoiding the traditional - and often cliched - adherence to the usage of zombies, demons, or other such monsters; instead focusing primarily on humans. Christopher Cherubini, former Lead Artist for Infinity Ward, and David Chiapperino, most recently of Disney Interactive Studios, have teamed up to launch a new independent game studio. Entitled Jupiter Moon Studios, this LA based gaming startup aims to "create beloved experiences through character, story, and gameplay." Seeing an opportunity in the ever expanding social and casual gaming sector, Jupiter Moon Studios' small contingent of staff are shifting away from traditional multimillion dollar projects. Doing so affords them the opportunity to take creative risks that may not have been possible if and when operating under a larger publisher, as well as the ability to retain ownership of their work. Having raised their own start up capital, co-founders Cherubini and Chiapperino are taking something of a grassroots approach on this new venture, focusing on the creation of gaming experiences that are as unique as they are accessible. Their first IP is the colorful and addictive iOS puzzle game, Bunny Popper. It is available now for the iPad, with a planned iPhone version in the works. (Look for our review soon!) Beyond iOS development, Jupiter Moon hopes to expand their portfolio to include games for other emerging technologies as well.